Right now the BF and I are renters but hopefully one day we will have a place of our own. Since I have a weird obsession with interiors (as most of the people who read this blog do) I save lots of inspiration photos, before and after photos being my favorite. When the time comes for us to buy, I want to buy the ugliest house/apartment [read- least expensive] in the nicest neighborhood. I do not want to pay for ugly taste, I mean why buy a recently renovated kitchen if I hate the cabinets, counter tops and floors? I'd rather buy the house that hasn't sold because of the ugly kitchen, bathroom and carpet that no one else wanted to tackle. Anyway, back to the point of this post...I save lots of before and after pictures because I love to see what other people have done to make a space their own. How much or little they changed and what changes can be made that make the largest impact are always educational to me. Does anyone else feel the same way I do about buying a house...or am I alone in this thinking?? Well, we bought our first home last month, and we bought a renovated one for simplicity sake (we just moved back to the US and the husband is in the middle of a ton of training for work). However, we are totally with you. This is not our forever home, not even close, and when we finally have some time and are settling down I want something I can rip apart. In fact, every time one of the renovators comes over to deal with an issue, I bug them asking 1,000 questions! My husband and I want to do the same thing. I feel like there would be so much more satisfaction redoing the house the way we want it! Go for it! We did it- bought a ranch (which I never thought I would buy- but the housing market of 2004 was out of control) in a suburb of Boston that was totally 70's decor but had great bones. It's been so much fun (and hard work) updating it and making it our own. You have the right idea, completely!! The neighborhood I wanted to move into is new construction, but I bought the house that sat on the market the longest. Got it at a great price and have been changing the things that I didn't like, or were done wrong, ever since. I've had this same makeover saved in y favorites for over a year. 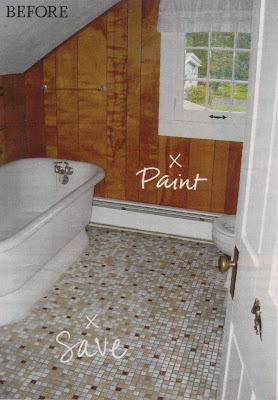 I have a knotty pine bath that I am dying to paint. Janell you could take a tin can and making it an amazing place to live...anythign you touch turns out beautiful! Love the bathroom! Even the tile! I hope I would be crafty/handy enough to get a fixer-upper! 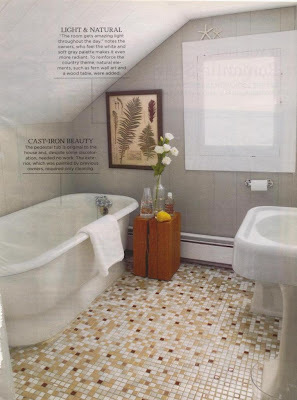 Great example of a smart bathroom reno. You're 100% right about buying the ugly house (just make sure there are no structural problems.) We did that in 1998 and it has proved to be a great financial decision. Wow- amazing transformation! A little paint goes a looong way :) The tiled floor was fab to being with too! I could not agree more with what you said, a home needs to have some character. It's so crazy how paint changes rooms. I painted a few rooms back in SF that significantly were changed by the paint! It is my dream to buy ugly or build. Unfortunately it is not my husbands dream to buy ugly, so we will have to strike it rich if we want to custom build. When we searched for houses we knew we wanted something with character aka old, ugly, etc. All of your requirements. We got what we wanted and spent lots of time renovating things to our liking. I would totally do it again in a heartbeat, but poor jon is set against it since he had to do a lot of the manual labor himself! im with you. buy ugly in a nice neighborhood and you not only get what you want but should you ever sell you would make much more than you spent. What an amazing transformation! I agree with you, my next house will definitely be the worst house in the best neighborhood. 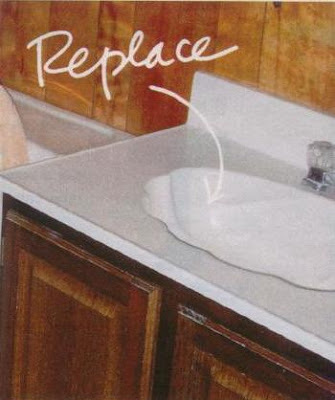 I don't want to feel guilty about ripping out perfectly good, but ugly, cabinets, flooring, etc. I know it will be a lot of work, but it will be worth it! I had never really thought about it before, but it really is a great idea. There is not reason to spend a ton of money on a house with all new things and have it be something you hate! It is guaranteed that any ugly house you buy will turn out looking amazing when your done with it! I feel exactly that way... which is why we bought a crappy townhouse that was built in the early 70s. We have done as much reno as we can... but then my (now) husband admitted that he hates doing renos. He only likes it if my dad has flown out to help! Abbie, that sounds like my boyfriend too! He hates DIY stuff, he is really into moving in somewhere thats move in ready, but I am no way doing that :) It should be interesting when the time comes to look for a place. you are SO right on!! you're going to do an awesome job!! that's just what we did & it's so much fun. why spend your money on others' renovations?! I rent too and constantly tag inspiration photos for when I can re-do a home we own. I'm with you, before and after photos are so much fun to study and save for inspiration. Re-do's are a lot of work, but the plus side is that you get exactly what you're looking for in the end. We bought a serious fixer. It's going to take forever but in the end it'll be worth it. Having had to redo rooms myself...It is nice to put your own stamp on a place, but I gotta say...I'm tired. Ah ha. It's amazing how little details can make all the difference! what a great reno. talk about being resourceful and having the eye to know what will still work without having to gut everything. We always buy the ugliest house on the street then fix it up, live in it for two years then sell it. On to bigger and uglier...except this last house...we're staying. Plus it will probably take until I'm 80 to finish the renovations. I totally agree with you! I absolutely cannot wait to transform an ugly duckling into a beautiful home! Who wants to pay a premium for something that's already done and not to your specific taste? My dream is to transform a house in lovely downtown Newburyport, MA! In our corner of the world, a cool and truly "old" house is either out of our budget (even in un-renovated ugly state) or on the wrooooong side of town. So, we bought a 70's ranch in the 'burbs that had some updates, but not a bunch, and we're doing the rest. The floors were already done (they're laminate, but better than carpet), and they had fixed the foundation. We're just left with replacing ugly fixtures, painting, lots and lots of painting, popcorn ceilings, and replacing some wonky door frames. It's been a slow process, mainly because my husband is not as DIY gung-ho as I am, and also because we are trying to pay for everything ourselves with cash. We're in newer construction, so it's not quite the fixup I had wanted, but I hear you! Go for the ugliest, cheapest and make it into the best around! No satisfaction like that (but it is hard work). I love how they kept the floor.